Two raw salmon fillets on a cutting board. Salmon is high in omega-3 fatty acids, a nutrient important for a healthy cardiovascular system, healthy joints, and a healthy brain. 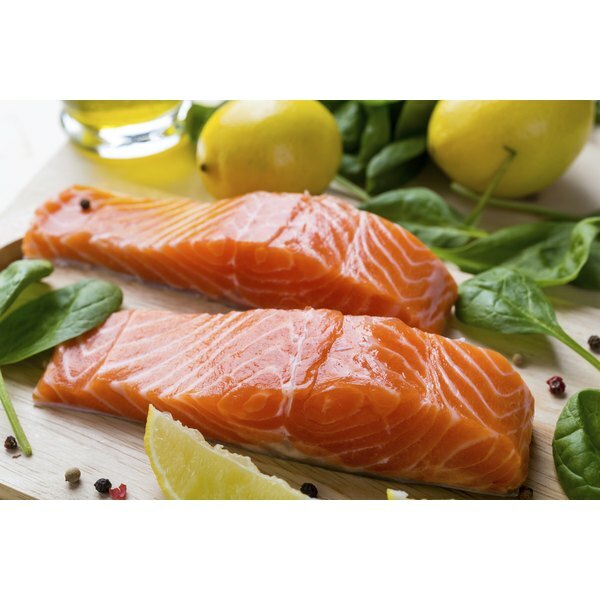 Salmon contains as much protein per bite as chicken and beef, but it is lower in both calories and saturated fat. Broiling salmon is one of the fastest, easiest ways to prepare this healthy food. Line the broiling pan or baking sheet with aluminum foil to make cleanup easier. Wash the salmon fillets and pat them dry with paper towels. Put them skin-side down on the broiling pan. Squeeze roughly a teaspoon of fresh lemon over each fillet. Brush the fillets with melted butter. Sprinkle a little salt and pepper on them. Place the salmon fillets under the broiler. They should be 3 to 4 inches from the heat source. Broil the salmon for eight to 10 minutes or until they'rre done. Begin testing the salmon after about six minutes. Insert a fork into one of the natural joins in the salmon flesh. The salmon should flake easily, and the flesh should be opaque. Alternatively, insert a meat thermometer. into the thickest part of the filet. The internal temperature in the thickest part of the fillet should be 140 degrees Fahrenheit. Remove the salmon from the pan carefully with a large spatula or pancake turner. For thicker fillets, increase the distance between the fillet and the broiler. 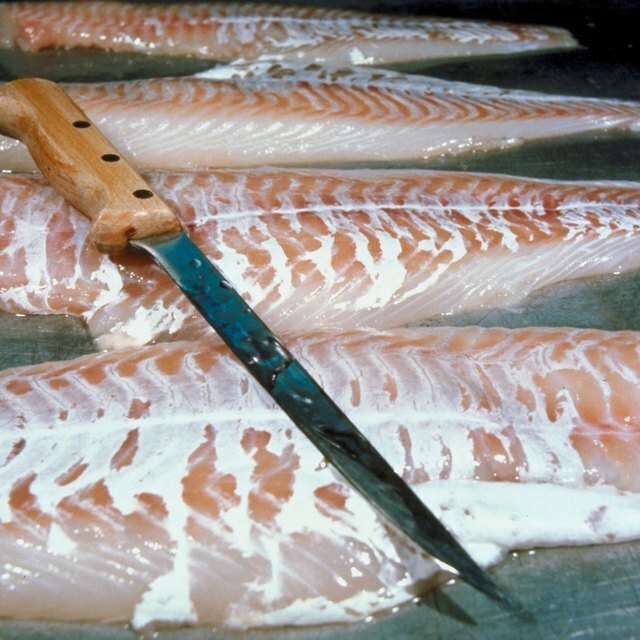 Avoid broiling fillets thinner than 3/4-inch thick. They tend to dry out when broiled. Though you typically don't have to turn salmon fillets when you broil them, if the fillets are thicker than 1 inch, you may wish to do so to make sure that they broil all the way through. To add sauces to your salmon fillet, wait until after the fillet is cooked to add them. Sauces -- especially heavy or thick sauces -- can insulate the fish so it doesn't broil evenly.